Last Voyage of the Black Betty, the debut Rustmonster pirate music project, was a dream fulfilled for me. Everyone has a little pirate in them. This album was my opportunity to let that pirate out. 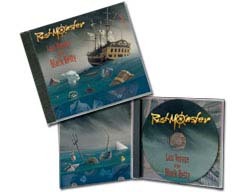 I have played with members of Rustmonster for going on 15 years now in different projects. We spent six years writing songs and gigging as a band called Funktoast. When that project wrapped up, I was bummed out. A couple of years later, someone approached me about putting together something for an independence day celebration. I contacted the Funktoast guys and we started rehearsing. We decided on country music of all things, mainly because none of us liked country and, you know, you need to confront your demons. We had so much fun playing together again that we decided to keep going. Two country albums later—recording as The Big Sky Country Boys–we moved to new wave music just for kicks. We recorded an album of waver covers under the moniker, New Wave Dave. When that wrapped up, we finally felt ready to do the thing we had talked about for nearly a decade: pirate music. Rustmonster was born. I remember an obscure movie I watched back in the early nineties called The Blood of Heros. The picture, starring Rutger Houwer, was about a post-apocalyptic extreme sport that involved blood, guts, and scoring points with a dog skull. One of the movie’s scenes featured an apocalyptic band that played obscure instruments. That band planted a seed in me. I wanted to be a member of that band. I filed away the notion for more conventional musical projects. However, when we started talking about pirate music, that band came to mind. I wanted to play that kind of music: songs with soul and heavy experimentation. I wanted to write songs that pirates would really listen to, that they would sing in taverns. I must say, as we wrapped up Last Voyage of the Black Betty, I felt pleased with the results. I had all the fun I could have expected and wound up with a dang cool recording that I could share with my friends. If you haven’t heard it, I invite you to check it out. I hope you like it as much as I do. Intrigued? Pick up a copy of Last Voyage of the Black Betty today.